Iran has "prepared an updated nuclear package" and is ready to hold talks with world powers, the country’s state-run Press TV reported Tuesday. Iran will offer the new package to the five veto-wielding members of the U.N. Security Council and Germany, Press TV reported. 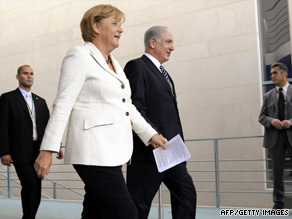 The six countries will meet Wednesday in Frankfurt, Germany to discuss Iran’s nuclear program, the network said. The network did not say what the new package entailed. The news comes days after Germany warned Iran that it has a limited time to return to international talks on its nuclear program before it faces stiffer sanctions. German Chancellor Angela Merkel said she hoped to have a “positive answer” from Iran soon, or else stronger measures would have to be discussed. Germany has played a leading role in trying to break the diplomatic impasse over Iran’s nuclear program, which Tehran says is aimed at generating civilian power but Western nations suspect is to develop nuclear weapons. The U.N. Security Council has asked Iran to halt its uranium enrichment program, and the International Atomic Energy Agency — which is the U.N. nuclear watchdog — has asked Iran to clear up questions about the nature of its work.